Due for HD DVD release today, the award-winning IMAX space documentary 'Chronos' will be hitting stores thanks to a new distributor, who have also announced a Blu-ray version for release early next year. Originally expected from indie distributor Goldhil way back in April to coincide with the HD DVD hardware launch, we originally reported that the company had bumped the release to upgrade the disc's features. Word then came to us late last week that 'Chronos' -- the first IMAX film to see a next-gen release, by the way -- was back on the schedule and due in stores today, December 5. However, we now have some updated info. Koch Entertainment has taken control of the rights to the title, and has sent us updated specs. In addition to a new 1080i (not 1080p) transfer in a 1.78:1 aspect ratio (reformatted from the original IMAX exhibition of 1.37:1), the disc will come with the audio triple play of Dolby Digital-Plus (48kHz, 24-bit), DTS-HD (96kHz, 24-bit) and PCM (48kHz, 24-bit) 2.0 stereo tracks. Koch has set a suggested $24.95 list price for the release. 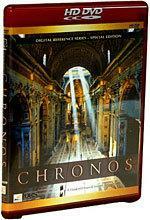 The distributor also informs us that a Blu-ray version of 'Chronos' is also due for release in February 2007. But in what is likely to be a controversial decision, Koch has decided to upgrade the Blu-ray transfer to full 1080p, as well as use a higher bitrate DTS HD Lossless Master Audio soundtrack. This one will certainly make for an interesting comparison review, and stay tuned for more details on the Blu-ray version when it is officially announced. Full specs for the HD DVD have now been added to our HD DVD Release Schedule, as well as a preliminary listing for the Blu-ray version to our Blu-ray Release Schedule.